Superman brings Clark Kent to his Fortress to find out what his deal is. He uses a globe on Clark that finds a person's deepest memories and their honest feelings and it is revealed that this Clark was adopted by the Kents and became a reporter but was never Superman. That Superman took him to the Rockies one day because Clark's investigation of Geneticron put him in grave danger. There he stayed receiving periodic visits from Superman until those stopped. Fearing something bad had happened Clark made his way back to Metropolis and discovered that his friend had died. The Pre-Flashpoint Superman accepts the Globes findings but doesn't reveal his full background to Clark. He gives Clark a signal watch before they head back to Metropolis and discover that the Geneticron building has disappeared. Both men resolve to find out how this happened. Clark writes an article for the Daily Planet about the new Superman and Superman heads back and shows his family the tunnel system he created for them. Meanwhile a bearded man heads back to his apartment and tells a flaming meteor with a Superman symbol that the path is clear and the only answer... is death. 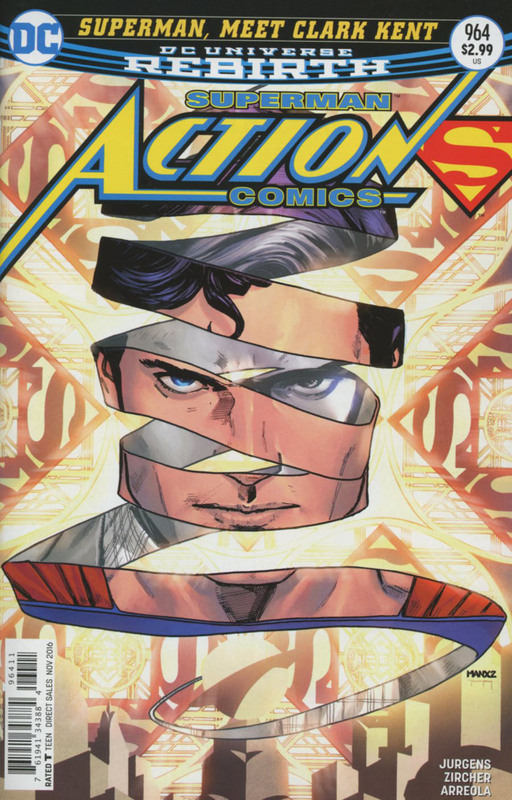 Story - 5: This issue was essentially an extended conversation between Superman and Clark Kent. That's not a bad thing by any stretch of the imagination because after six straight issues of Doomsday fueled action this issue and the previous one has been a nice breather. This issue also didn't solve the mystery of who this Clark Kent really is. The revelation of Clark's upbringing and how he got involved with Superman doesn't jibe with the past five years of stories at all. Again, this is not a bad thing by any stretch of the imagination. It actually raised more questions that it answered, which I like at this stage of the game. For the most part I haven't tried playing the guessing game but for grins I started thinking about where this Clark Kent came from. I narrowed it down to two choices. Option 1: This Clark is from another reality that managed to wander into this one. How? Either the walls of reality are weakening in general thanks to Wally West's return or the people behind the ten years of stolen time let it happen. Regardless he's actually Clark Kent just not the Clark Kent from the New 52. Option 2: He is a plant from the people behind the ten years of stolen time designed to throw Superman off. He was able to pass the super lie detector test because the people behind him are powerful enough to fake it. In the end it really doesn't matter to me what's actually going on. I'm so entertained that I am willing to let things play out without trying to stay one step ahead of the creators. 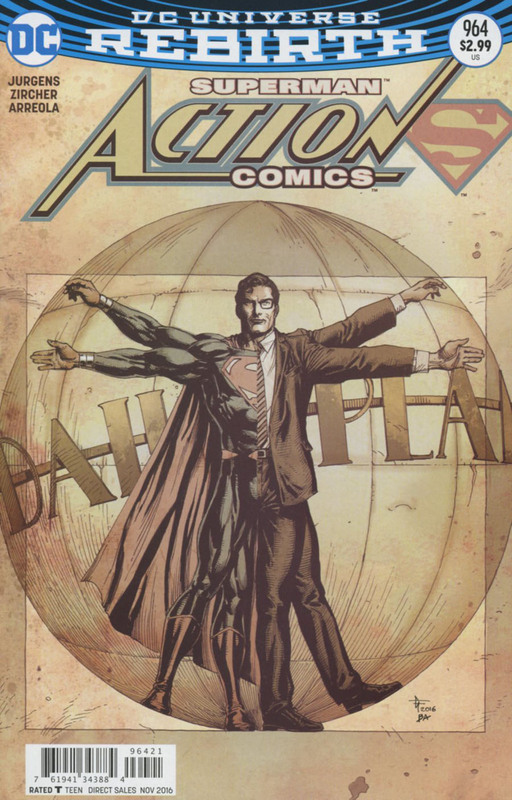 Last issue was told mainly from Clark's perspective. Jurgens switches narrators this time out and we mainly get Superman's take on things outside of Clark's article. I liked this quite a bit. It brings balance to the overall story. I especially liked that after he gave Clark the super lie detector test he then gave Clark a signal watch, which is a sign of trust. Part of me was a bit disappointed that he didn't reveal where he actually came from to Clark but I think this was prudent on Superman's part as he still isn't entirely sure what's going on. This doesn't stop him from forming a partnership of sorts with Clark which led into the continuing mystery of Geneticron. The use of the article as a narrative device at the end of the issue worked for me. It laid out to the world who this replacement Superman is and how he's here to help. This Clark proves how humble he is by saying he couldn't be as selfless as Superman is even though he put his life on the line to get to the truth of Geneticron in the previous issue. It was a nice piece though I'm not sure how newspaper authentic it was. In the end it doesn't really matter. Of course if this Clark is a plant for the bad guys then the article is a ruse, which also works. The final page was a fantastic way to end the issue. What the heck is that thing? It kind of has an Apokolips vibe to it with the four fire pits but it also reminds me of Solaris, a villain Grant Morrison created around the time of DC ONE MILLION. The fact that it has the Superman symbol on it just creates more questions. And who the heck is that bearded man? And how did he fit that thing in his apartment? Okay. The last question was a joke but the other questions are real and like the mystery behind Clark Kent I'm just going to sit back and watch the story unfold. Jurgens has yet to let me down during this run so I am working under the assumption that the revelation is going to be fantastic. Art - 5: Patch Zircher did not disappoint with the art in this issue. There wasn't a whole lot of action to this story but he more than kept things interesting with his backgrounds. I liked his take on Superman's fortress quite a bit. His facial expressions and body language fit perfectly with the dialogue and both Clark and Superman looked great throughout the issue. His shining moment was the art that surrounded Clark's story. I'm a big fan where the writing is going one way and the art is going another and I especially liked the shots of the bearded man walking to his apartment next to the part of the article that discussed the fact that threats lurk around every corner. The last page was amazing and had a nice creepy vibe to it and the perfect way to end the issue. Cover Art - 5: There is so much to love about this cover. The clusters of S symbols are eye catching but the center piece, literally, is the head and neck of Superman. The ribbon effect of Superman in color and Clark in black in white was dynamic and made for a great image. Variant Cover Art - 5: This cover was a nice play on Leonardo Da Vinci's drawing The Vitruvian Man. That piece was a mix of mathematics and art which demonstrated Da Vinci's understanding of proportion while at the same time serving as a cosmography of the microcosm as he believed that the workings of the human body could be an analogy of the workings of the universe. I don't know if this was Gary Frank's intent but to me using that piece as the basis of the cover speaks to the proportion of Clark and Superman and how both sides of the character are necessary. The art itself is very well done these variant covers have yet to disappoint.